Ali shoots a glance at Duke, one of his advisers at TransIP — a web hosting company he set up as a twenty-year-old during his university years. In just a few years he expanded it into the largest web-hosting provider of the Netherlands. With around 100 employees and over 200,000 clients, it has a turnover of tens of millions of euros. Sitting across from each other at a restaurant, they appear to be polar opposites. He, Duke, is of robust build. With his dark-blond hair and cool blue gaze, he looks like the archetype of Dutch sobriety. He gives his full attention to his environment. Ali, boyish, has pitch-black hair and dark, flitting eyes. Hyperactive and constantly multitasking, he is easily distracted. His thoughts always a few steps ahead of the moment. Their backgrounds are miles apart too. Duke, 43 years old, built his career within the corporate structures of the financial world, moving from company to company. Ali, fourteen years younger, is the self-made man. The nonconformist buccaneer, fan of Nietzsche and Dostoevsky. He prefers building his own corporate structures. Despite their differences, they share important values and traits. Honesty and an open mind being the two main ones. Without these similarities they would never have connected. Ali only accepts advice from people he likes and who tell him the truth. Why waste precious time on people who annoy you, or convey cryptic or inaccurate messages? If Ali likes you, and the feeling is mutual, then it must be because you have an open mind, an absolute precondition of innovation in Ali’s eyes: ‘only open minds can shape the future’. driven bank; a radically renewed bank of the future, spawned from irritation of the existing banking system’s self-serving efforts to prop up an outdated money industry. Ali’s irritation reached an all-time high a few weeks ago. On a beautiful summer day, during a small picnic, he received a phone call. TransIP was suffering and literally couldn’t do any business because one of the primary online payment systems in the Netherlands was down. At that moment, a snippet from something he heard on the radio earlier that morning came to mind. The crisis was in full swing and politicians were scrambling over one another to spew their opinions on the matter. He realized there was something he could do. Why not overturn the banks’ entire moneymaking system? Why not replace a complex structure made of cards, machines and bank transactions with a simple and direct payment system among people? Hadn’t the start of TransIP once been brought on by his annoyance at the amount of paperwork and hand-filled forms that needed to be faxed over, just to register a domain name? The technology to deliver such huge change was already available and the need for change was massive. And Duke? He has the financial background as well as the interest and intellect to not only grasp the idea, but also its consequences. Duke has a moment of silence. He sips his coffee and gazes out the window. He realizes that Ali’s question is no innocent one. In reality it means: are you in? Ali needs someone who knows his way around the financial world, someone like him. Together they would make a great team indeed. A positive answer would however also imply his departure from the comfort of Ernst & Young, where he was recently promoted to Executive Director of Transaction Advisory Services. Duke nods. It’s not the bankers, not the employees, it’s the consequence of an obsolete system… ‘I’ll consider it,’ he says. Ali pays the bill. As they exit the restaurant, the sparrows scatter from their path. Duke heads to his semi-electric bicycle at the north exit of the Max Euweplein, a square in Amsterdam. ‘Homo sapiens non urinat in ventum’ is inscribed across the archway: ‘Sensible people don’t pee into the wind’. Duke absentmindedly fidgets with the lock. A new sort of bank, an app really, nothing more… What do you think? What’s the next step forward? As he rides his bike through the beautiful streets of Amsterdam, his mind keeps going over their conversation. Memories of his time at Citibank start to loom. It was over ten years ago: he spent each and every day optimizing yield to maximize profits. In the morning, the money flowed in, often several billions. By the evening it was gone again. Yet somehow more than enough money was left each day to cover for the office space, the employees and the shareholders. Everyone had their own task to keep the system going, but no one seemed to consider what they were actually doing anymore. Most of them were primarily concerned with reeling in their bonuses, while others focused on backstabbing their colleagues. It all boils down to what’s the right thing to do? And how do we make this come true? This idea completely changes the view of what a bank should be. What if we really could change the system? What if — even in a minor way — we could actually change that essence and transform it into something new? If we could do more than just keep talking about change and complain about all that is wrong with the world? Would our efforts mean that we could actually change the world for the better? Slowly but surely a feeling creeps up on him: maybe, just maybe, change would be possible. Maybe they really can make a difference. Lost in his thoughts, Duke doesn’t hear the frantic ringing of the tram until the very last moment. He immediately hurls himself and his bike out of the tram’s path, barely avoiding a grim collision. His rear tire gets caught in the tracks. He manages to pull away in the nick of time, just in front of the oncoming wheels. Sensible or not, he realizes: they shall be peeing into the wind. Today marks July 19, 2012. Read more? 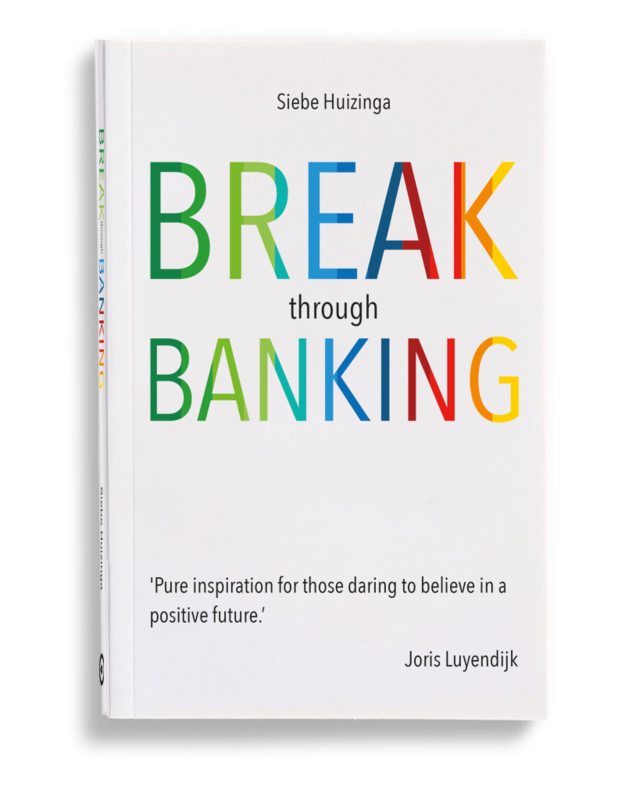 Order Break Through Banking. You can also download the book as e-pub.